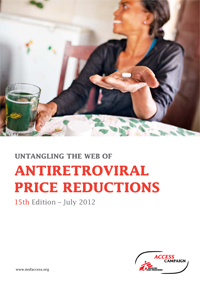 The 15th edition of Untangling the Web of Antiretroviral Price Reductions (UTW. In June 2011, governments committed to a target of reaching 15 million people with antiretroviral treatment (ART) by 2015 at the UN High-level Meeting on HIV/AIDS. If this target is met, UNAIDS estimates that up to twelve million infections and more than seven million deaths can be averted by 2020, and that the number of new infections could be reduced by more than half by 2015. Now is a critical time to ensure widest possible access to ART: a landmark scientific breakthrough in 2011 showed that treatment with antiretroviral medicines (ARVs) not only saves lives, but can also stop HIV from being transmitted by up to 96%. In response to this evidence, in 2012 the World Health Organization (WHO) issued guidance supporting immediate treatment–regardless of a person’s immune system’s status or CD4 count–for HIV-positive people who have HIV-negative partners, in order to help prevent transmission of the virus. At the same time, guidance was also issued suggesting the possibility of offering full antiretroviral therapy for life to all pregnant women living with HIV for prevention of mother-to-child transmission of the virus (PMTCT). This protocol–‘option B+’–is easier to manage than starting and stopping PMTCT with each pregnancy, and better for mothers and their babies. It is therefore critical to ensure the most robust and easiest-to-use medicines needed are made affordable to the largest number of people in developing countries. Over the past year, since the last edition of Untangling The Web, there have been mild price reductions for the newer ARVs recommended by WHO in its 2010 guidelines for first-line therapy, like tenofovir. Greater reductions are needed to support further scale-up. Meanwhile, second- and third-line ARVs remain priced many times higher than first-line drugs. Further, middle-income countries are no longer offered standardised price discounts by originator companies, forcing them to negotiate ARV price reductions on a case-by-case basis. Some ground has been lost, as middle- income countries are once again paying exorbitant prices for the newest drugs. And battles over intellectual property in the world’s main producer of affordable ARVs–India–continue to heat up, while voluntary measures by companies to increase access require much closer scrutiny and investigation. Download the updated report and previous versions of UTW here. Read more about the IAS Conference 2012 here.